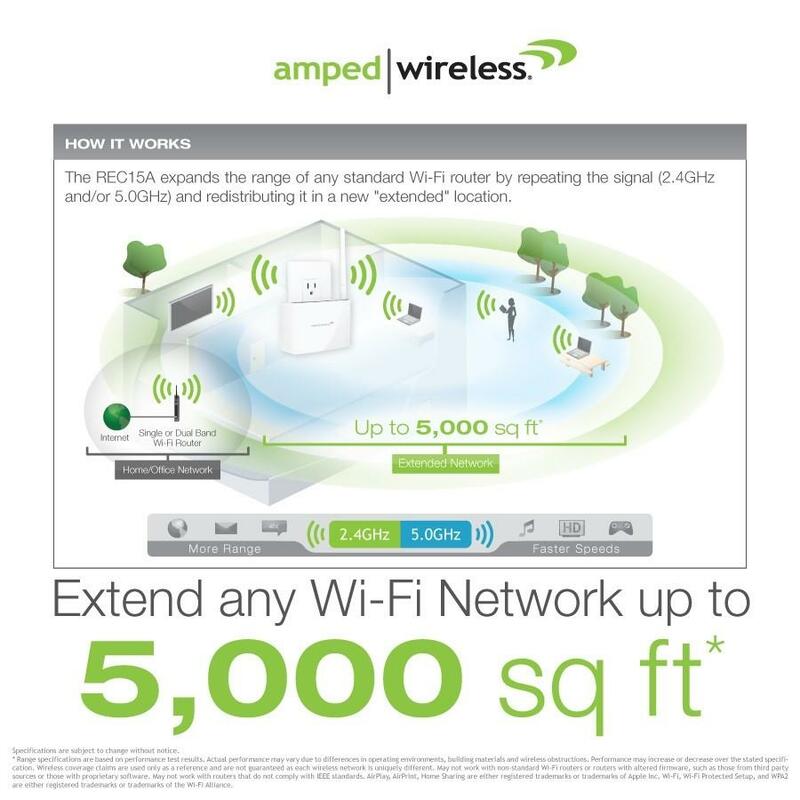 Up to 5,000 sq feet Wi-Fi coverage - Extend the range of any single or dual band Wi-Fi router. Adjust the coverage distance of your wireless network. Big Power in a Discreet Design - Eliminate dead spots & get more range with high power amplifiers & high gain antennas. Create additional Networks - Add up to 8 additional networks for guests & other rooms. Control when your Wi-Fi is on or off & restrict access to specific users. See how the REC15A works. 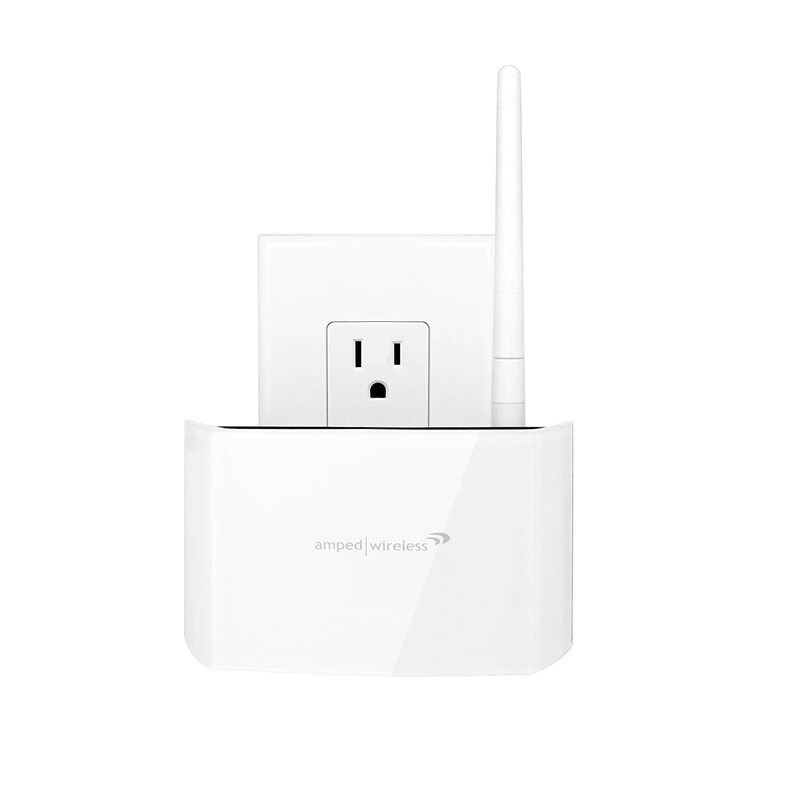 This Amped Wireless High Power Compact AC Wi-Fi Range Extender expands the range of any Wi-Fi network by repeating the signal from your existing Wi-Fi router and redistributing that signal in up to 5,000 sq ft of space. 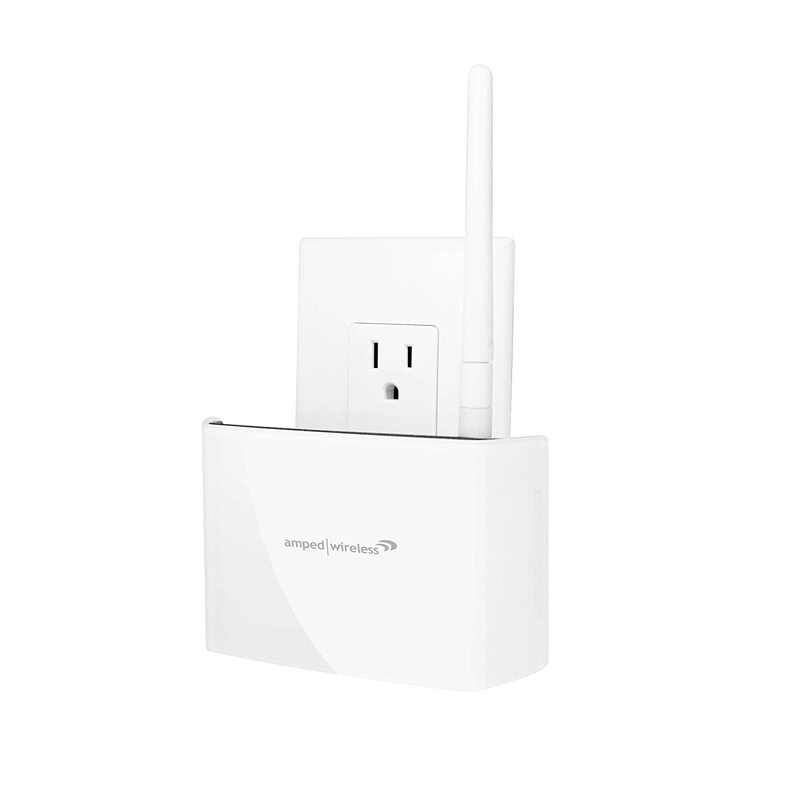 This elegant, discreet, plug-in Wi-Fi Extender provides industry leading Wi-Fi coverage coupled with ultra-fast 802.11ac Wi-Fi speeds - to allow for the best of Wi-Fi experiences. Whether you are streaming HD movies onto multiple devices, knocking out the competition on your online gaming platform, or downloading music - the REC15A can handle it. 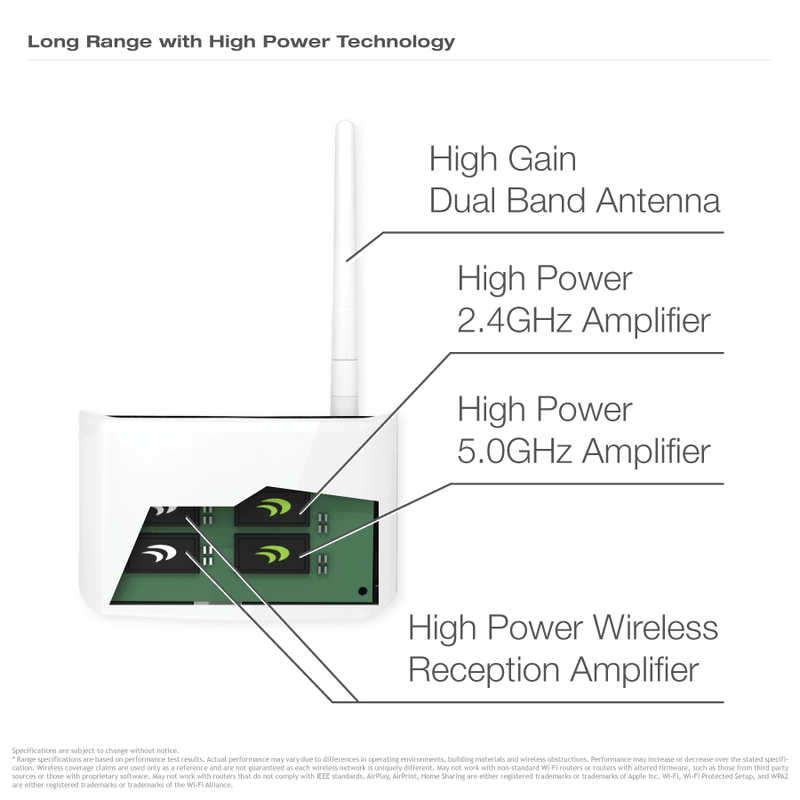 This Compact Range Extender is made up of Amped Wireless High Power Technology, equipped with a total of four amplifiers; one 2.4GHz amplifier, one 5.0GHz amplifier, two low noise amplifiers, as well as one high gain, dual band antenna. The REC15A also includes one wired port for connecting and bridging an additional network device, such as a PC or TV. If your home or office needs more Wi-Fi range or if you simply need to eliminate frustrating dead spots, this universal Wi-Fi range extender is right for you. 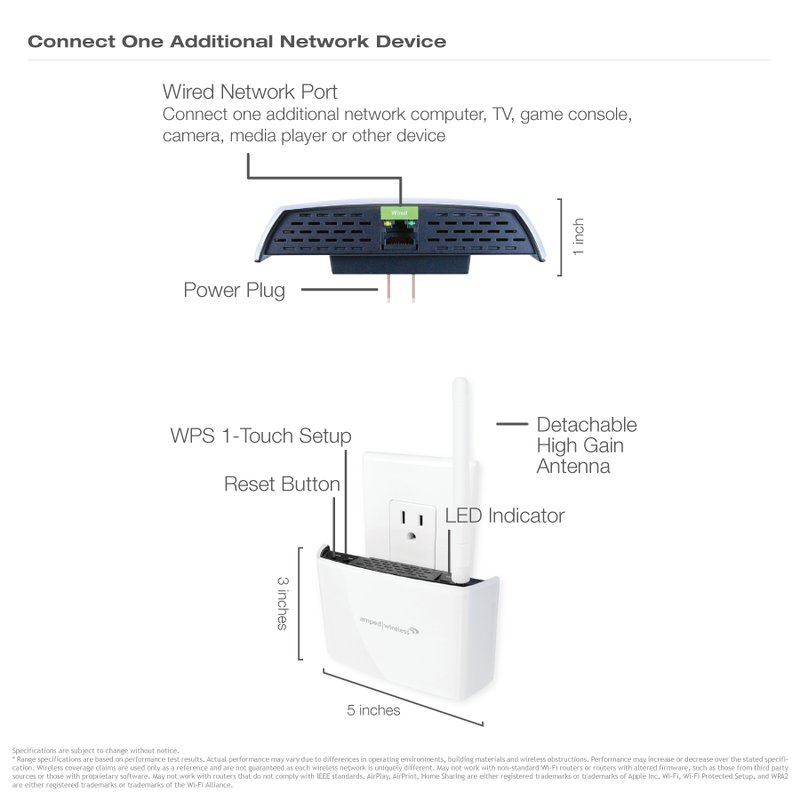 Flawlessly connect this Extender to any existing Router and unleash your laptops, iPads, Android tablets, Windows 8 tablets, smartphones, and e-readers with the most powerful Compact Wi-Fi Range Extender available. The Amped Wireless Free Wi-Fi Analytics Tool helps you to analyze and optimize your Wi-fi network - to allow for maximum speed and coverage. The app is free to download and compatible with Android devices and Windows PCs. Download it today and get the most out of your wireless network. *Range specifications are based on performance test results. Actual performance may very due to differences in operating environments, building materials, and wireless obstructions. Performance may increase or decrease over the stated specification. Wireless coverage claims are used only as a reference and are not guaranteed as each wireless network is uniquely different. AC wireless signal speeds achieved when connecting to other 802.11ac devices. Output power specifications are based on the maximum possible radio output power plus antenna gain. **May not work with non-standard Wi-Fi routers or routers with altered firmware, such as those from third party sources or those with proprietary software. May not work with routers that do not comply with IEEE standards. 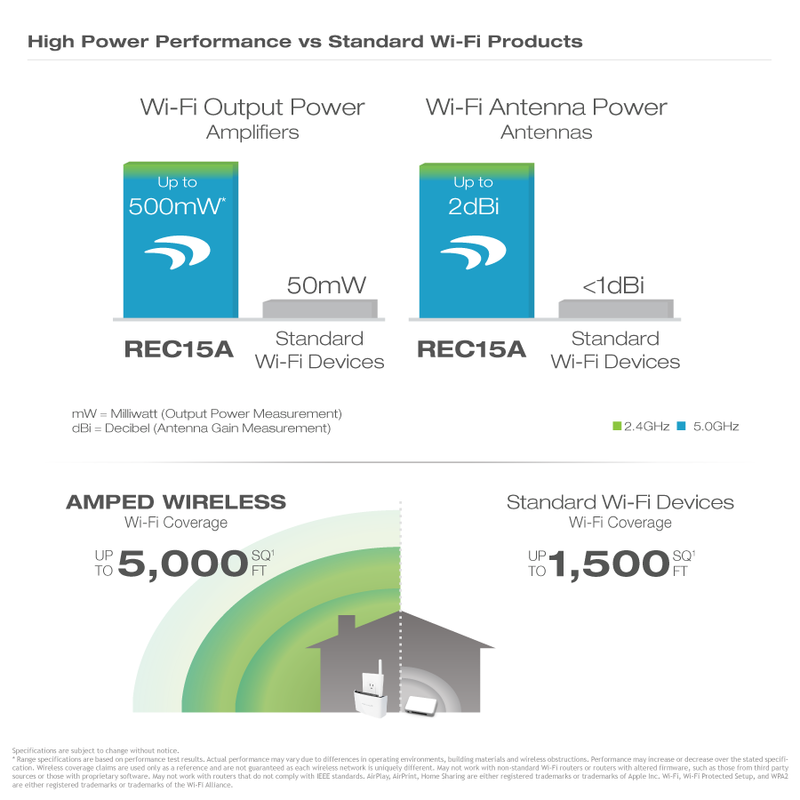 All Amped Wireless products feature advanced amplifiers and high gain antennas to provide more Wi-Fi coverage compared to standard Wi-Fi devices. 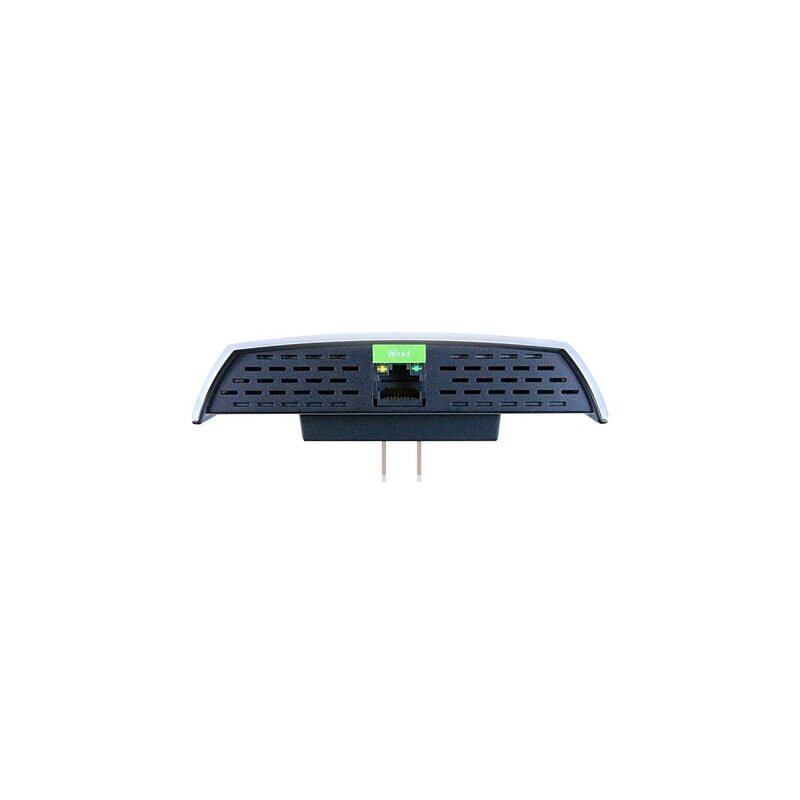 The REC15A features up to 500mW of output power and 2dBi antenna gain. That’s over 10x more output power than standard devices. In addition, standard Wi-Fi devices typically use internal antennas while the REC15A features one external, high gain, detachable dual band antenna to provide a better signal. Bring more range to your network and eliminate Wi-Fi dead spots with the REC15A's award-winning high power technology. The REC15A is equipped with a total of four amplifiers, one 2.4GHz amplifier, one 5.0GHz amplifier, two low noise amplifiers, and one high gain antenna to provide high performance Wi-Fi coverage. The technology makes all the difference. One Additional Port, see for yourself. Seamlessly connect your printer, computer, server, TV, hard drive or other network devices with ease. The REC15A provides one additional network port for connecting one more wired computer, A/V device, or other devices at ultra-fast wired speeds. Enjoy your HD video streaming and wireless gaming on multiple devices, simultaneously, with next generation 802.11ac Wi-Fi technology. 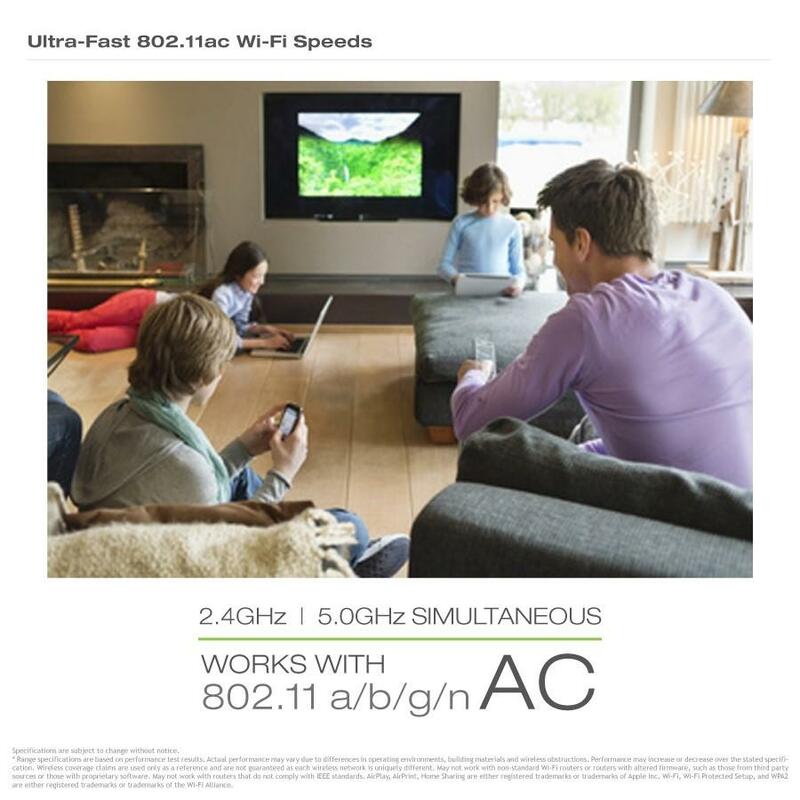 The latest technology, 802.11ac, provides Wi-Fi speeds up to 3x faster than 802.11n. The REC15A creates both a 2.4GHz and 5.0GHz extended network, simultaneously, and allows for additional guest networks. Getting started is easy. 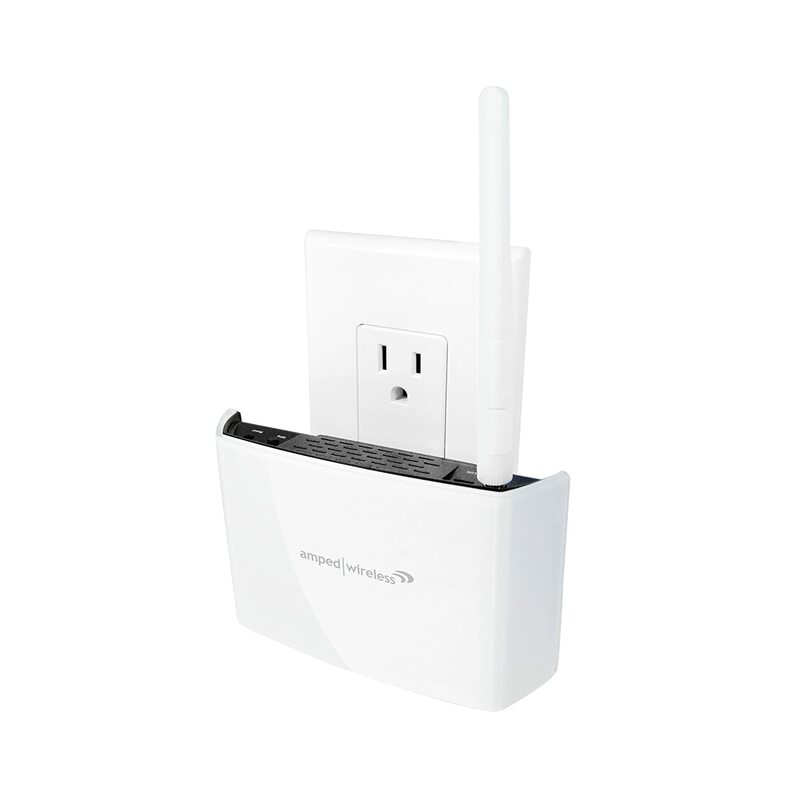 The REC15A works with all Wi-Fi routers, regardless of brand or technology (802.11a/b/g/n/ac). The setup wizard gets you up and running in minutes. 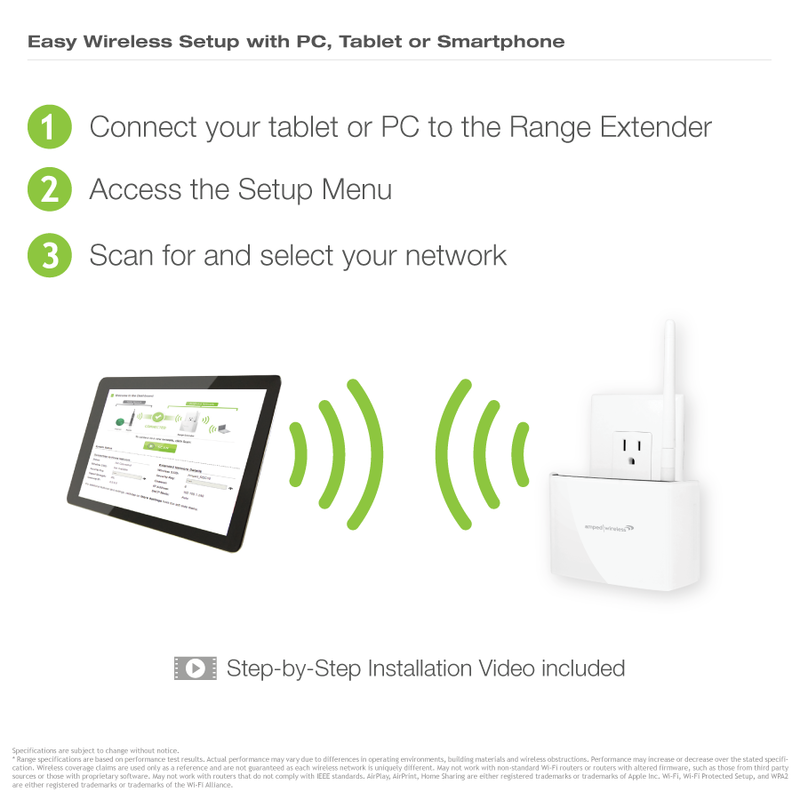 Simply connect your tablet or PC to the Range Extender's network, access the menu and scan for your home Wi-Fi network. The setup wizard will take care of the rest. A step-by-step setup video is also included to guide you through any issues you may encounter. 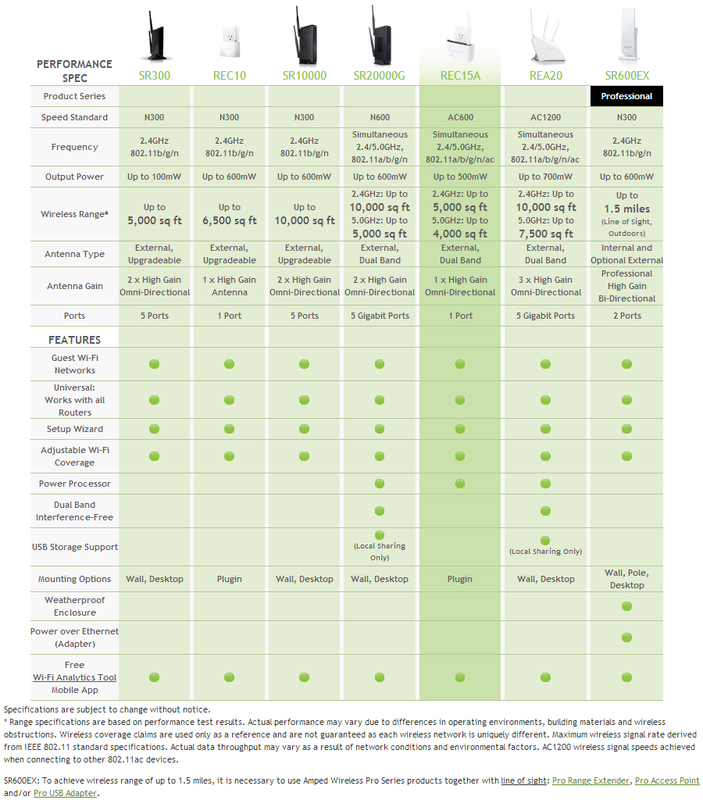 Find the Range Extender that you need. 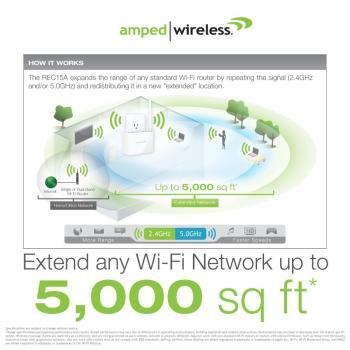 Amped Wireless has a full line of Range Extenders, from compact Range Extenders that feature a single Ethernet port to more powerful, dual band Extenders that feature up to five gigabit ports. Find the solution that best fits the size of your home or office, the amount of power you need, and the number of ports that will best serve your network.